On Feb. 15, Secretary of Labor Alexander Acosta joined Environmental Protection Agency (EPA) Administrator Scott Pruitt and fellow Cabinet members to outline a federal strategy to reduce childhood lead exposure and associated health risks. OSHA’s resource, If You Work Around Lead, Don’t Take It Home!, highlights the dangers to children of lead being transported home from work, and offers precautions that can be taken. For more information, read the EPA news release. Manuel Gallardo, owner of Gallardo’s Construction Services, was cited after OSHA inspectors observed employees exposed to fall hazards on six Chicago-area residential roofing projects between August and November 2017. Gallardo was cited for four willful and three repeated violations for failing to: install fall protection systems, ensure the use of protective devices, and train workers in fall protection hazards. OSHA proposed penalties of $281,286. For more information, read the news release. OSHA has cited ABC Polymer Industries, LLC, after an employee suffered fatal injuries when she was pulled into a plastics recycling machine. The company faces $195,144 in penalties. 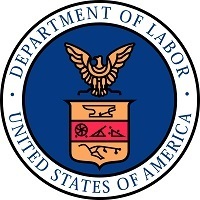 The employer received one willful citation for failing to provide machine guarding to protect employees from caught-in and amputation hazards. The company was also cited for repeat, serious, and other-than-serious violations, including not having specific safety procedures to shut down or isolate stored energy. For more information, see the news release. California OSHA issued $72,345 in penalties to Petro Chemical Materials Innovation in South Gate for failing to de-energize and guard a moving conveyer belt while a worker was cleaning it. The worker suffered a serious amputation injury to his right arm when his glove was caught in the moving conveyor belt. OSHA has entered into a settlement agreement with Environmental Management Specialists (EMS), Inc., of Steubenville, Ohio, that resolves a lawsuit filed under the anti-retaliation provision of the Occupational Safety and Health (OSH) Act. OSHA found that EMS fired a field technician after he filed complaints that employees were exposed to confined space and respiratory hazards. EMS will pay the technician $21,000 in back wages and remove all references to his termination from his record. For more information, read the news release. OSHA’s Agency Priority Goal for 2018 aims to reduce trenching and excavation hazards. According to the Bureau of Labor Statistics, excavation and trench-related fatalities in 2016 were nearly double the average of the previous five years. OSHA’s goal is to increase awareness of trenching hazards in construction, educate employers and workers on safe cave-in prevention solutions, and decrease the number of trench collapses. 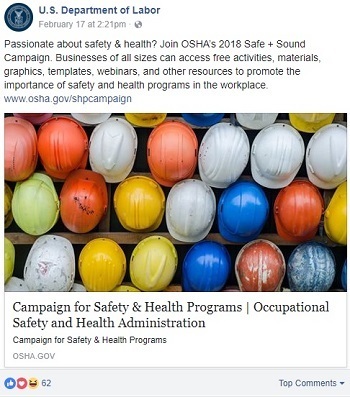 OSHA plans to issue public service announcements, support the National Utility Contractors Association’s 2018 Trench Safety Stand Down, update online resources on trench safety, and work with other industry associations and public utility companies to create an effective public-private effort to save lives. OSHA’s trenching and excavation national emphasis program is also currently under revision. 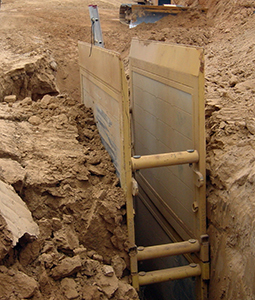 For more information on trench safety, visit OSHA's safety and health topics page. On March 1, OSHA will launch a Focus Four Campaign in the Mid-Atlantic States to address the four leading causes of fatal injuries in construction. Throughout March, the campaign will use toolbox talks and outreach events to focus on electrical hazards. 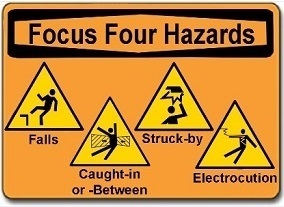 In April, the focus will be on struck-by hazards; May will target fall hazards; and June will focus on caught-in/between hazards. The campaign partners include OSHA consultation projects, state occupational safety and health agencies in Maryland and Virginia, the Mid-Atlantic Construction Safety Council, and the General Builders and Contractors Association. For more information, contact OSHA Assistant Regional Administrator Nicholas DeJesse. Grain Journal Magazine will host a free webinar March 6 featuring safety information provided through OSHA’s Alliance with the National Grain and Feed Association. 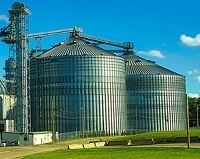 The webinar will cover fall protection at grain, feed, processing, and milling facilities. It will explain the hierarchy of fall prevention, to include passive fall protection, personal fall arrest, and restraint systems. OSHA’s requirement for fixed and portable ladders will also be discussed Register online to participate in the webinar. The Alliance is also a sponsor of a grain engulfment prevention effort taking place April 9-13, 2018. During the weeklong event, companies can participate by providing toolbox talks and training on lockout/tagout, fall prevention, and grain handling safety and health. For more information, visit the event webpage. 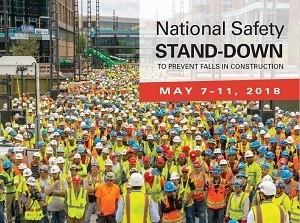 On March 21, an hour-long webinar on the National Safety Stand-Down to Prevent Falls in Construction will showcase plans for the 2018 event. Representatives from OSHA, the National Institute for Occupational Safety and Health, and CPWR—The Center for Construction Research and Training will participate. Falls are the leading cause of construction fatalities, accounting for one-third of on-the-job injuries and deaths in the industry. This year's Stand-Down is scheduled for May 7-11. 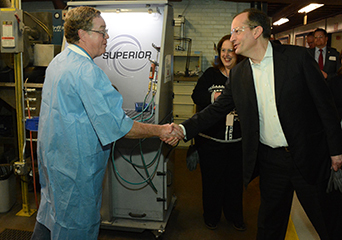 On Feb. 17, Secretary of Labor Alexander Acosta visited Raytheon Precision Manufacturing in Dallas to tour a facility that has been designated a Star site in OSHA’s Voluntary Protection Programs. VPP recognizes employers and workers in the private industry and federal agencies who have implemented effective safety and health programs and maintain injury and illness rates below national averages for their industries. The Raytheon site’s injury and illness incident rate is 69 percent below the average, and their rate of incidents resulting in lost work days is 93 percent below the national average. Raytheon achieved this low injury rate through such measures as an increased emphasis on ergonomics, improved ventilation systems for manufacturing processes, training on hazard recognition, and the presentation of weekly safety topics. T&L Foundry, Inc., in Glenpool, Okla., produces non-ferrous castings. The company contacted OSHA’s On-Site Consultation Program for help protecting the safety of its employees working with molten metals in this high-hazard industry. Since then, T&L established a safety committee made up of employees from all levels of the organization, and developed a comprehensive safety and health program. As a result of these and other improvements, the company was accepted into OSHA’s Safety & Health Achievement Recognition Program and has not had a recordable injury since August 2014. Over the last several years, T&L Foundry’s workers’ compensation insurance premium has dropped from $249,000 to $69,000. For more information, see the company’s success story. 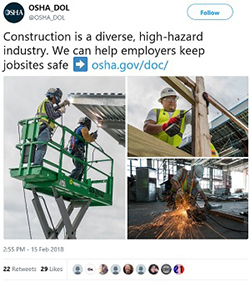 OSHA and Holder Construction Company entered a partnership to protect 180 workers during the construction of a seven-story commercial office building and a parking garage in Dallas. The partnership strives to prevent serious injuries and fatalities through training, best work practices, and improved safety and health programs. For more information, read the partnership agreement. The Strategic Partnership Program provides opportunities for OSHA to partner with employers, workers, professional or trade associations, labor organizations, and other interested stakeholders to create safe and healthful work environments. The United States Institute for Theatre Technology, and International Alliance of Theatrical Stage Employees, Moving Picture Technicians, Artists and Allied Crafts of the United States, its Territories and Canada, AFL-CIO, CLC renewed a five-year agreement to protect workers in the entertainment industry. Participants will share information about OSHA rulemakings, enforcement initiatives, and outreach campaigns. Read the news release for more information. The Buckeye Service, Transmission, Exploration, and Production Safety Network has renewed a three-year agreement to address hazards in Ohio’s oil and gas industry. For more information, read the news release. The Southern Illinois Carpenters Joint Apprenticeship Program has signed a two-year agreement to provide members of the St. Louis-Kansas City Carpenters Regional Council with training and resources to prevent common construction injuries. Read the news release for more information. The American Society of Safety Engineers’ on-demand webinar explains how companies can expect to see a positive return on their investment by implementing a safety and health program. The National Safety Council’s guide for safety practitioners outlines strategies to communicate the value of workplace safety and build management support for safety investments. Visit OSHA’s website for more information on safety and health programs. OSHA reminds employers of their obligation to post a copy of OSHA’s Form 300A, which summarizes job-related injuries and illnesses logged during 2017. Each year, between Feb. 1 and April 30, the summary must be displayed in a common area where notices to employees are usually posted. Businesses with 10 or fewer employees and those in certain low-hazard industries are exempt from OSHA recordkeeping and posting requirements. Visit OSHA's Recordkeeping Rule webpage for more information on recordkeeping requirements. QuickTakes is emailed free twice monthly to more than 205,000 subscribers. You can receive it faster and easier by subscribing to the RSS feed that delivers almost instant information. Visit OSHA's RSS Feeds webpage to subscribe.